Prior to coming to college is the time when kids seemingly play sports all year long, whether it’s the same sport in various leagues or trying a little bit of everything, that’s where it all starts. The energy of kids wears down as they grow, and playing more than one sport at a Division I level takes diligence and strength. It’s not impossible, though. Bobcats are doing it, jumping from fall to winter to spring sports. One of the most notable of the two-sport athletes at Quinnipiac is Kelly Babstock, whose illustrious women’s ice hockey career ended with 203 points, good for second most in career points on both men’s and women’s program history. After her season ended with a 6-0 loss to Clarkson in the ECAC Semifinals, she elected to take her athletic prowess and transition from women’s ice hockey to women’s lacrosse. Her return to the turf after not playing lacrosse for more than four years was an eventful one. Though the Bobcats lost to Bryant by a score of 18-5, Babstock scored her first collegiate lacrosse goal and recorded her first assist. Babstock started playing lacrosse at a very young age, saying her parents signed her up when she was only two. When the opportunity came up, she knew she wanted to play again. “I just wanted to play again, and when hockey season was done I thought it was worth a try and luckily I had the opportunity,” Babstock said. Head coach Danie Caro was pleased with the progress Babstock made leading up to her first game. Babstock certainly has been an asset to this squad already as evident in her stats after her first seven games with 12 goals and six assists. She has set the bar high for the women’s hockey program, but has a more shortsighted approach with lacrosse. “I want to win,” she said simply. Caro has confidence in her newest acquisition as well and sees her as a leader. 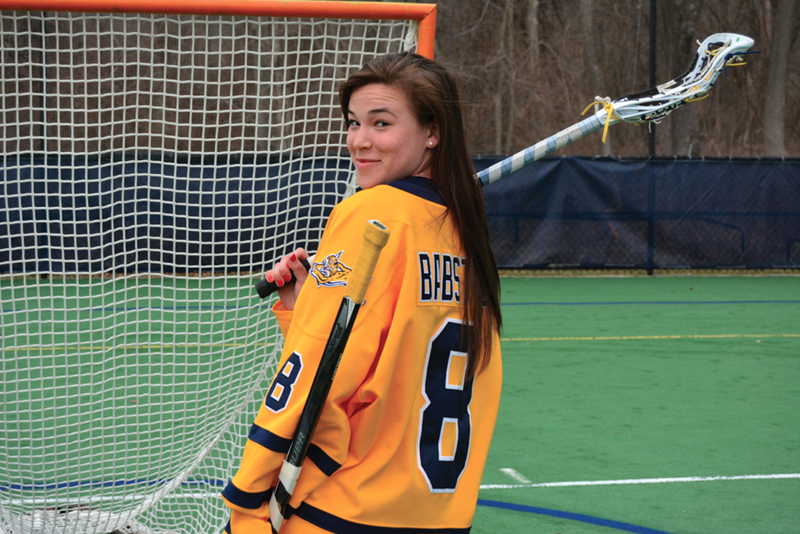 Babstock may be the biggest name of all the two-sport athletes on this campus, but she is certainly not the only one. Many of the women’s cross country runners also compete for the women’s indoor and outdoor track teams. Babstock’s fellow hockey teammate Elena Orlando has also played on the rugby team the past two seasons. Orlando’s rugby teammate Tayler Schussler is also a two-sport athlete, joining the softball team during the spring semester just before the season began. Orlando was the first of the group to become a two-sport athlete when she joined the women’s rugby team coached by Becky Carlson in the fall of 2012. In 2013, she recorded two tries and 17 assists, becoming valuable on offense towards the end of the season. Softball head coach Jill Karowski said the softball team lost several players throughout the school year and bringing in Schussler was an easy decision. “To have the opportunity to utilize some other sports that have experience, that already have that team mentality, that already have hard work and ethic based on recommendations from their head coaches, they came out here and the chemistry was really good with our girls. It was a no-brainer,” Karowski said. Schussler said after being home for winter break she realized how much she missed playing softball and that becoming a two-sport athlete has been good for her, both athletically and academically. “I think it actually makes me focus more because I know I have a lot of pressure on me from Coach Carlson and now Coach Karowski are both watching me, so I think it gives more of an incentive to do better in school and keep up with everything,” Schussler said. Schussler will play an important roles on the team as the back-up at third base and as a utility bench player for the team. She has appeared in nine games and scored one run in two at bats. It’s not just about these individual athletes becoming two-sport athletes, but their teammates have been supportive of the decision. At any women’s lacrosse home game, you can hear the women’s hockey players cheering for the team and Babstock. Women’s rugby players have also come out to root for their teammates at softball in their home games, as well. Regardless of what sport any of these athletes started out playing in their college career, both teams become a part of them and it ultimately brings the athletic community that much closer to together.